This was a Lottery Heritage funded project which we took part in. We decided to tell the stories of the street and houses of Bexley through archaeology and archive materials. We invited members of the public and local schools to come and learn how to trace the history of their street and house as well as training and help to dig a test pit. The workshops for the All Our Stories Project have now finished and the participants have completed their stories. We were involved with three school, Woodside School, Belvedere, Our Lady of the Rosary, Sidcup and Hurst School, Sidcup. We went into the schools and helped the children and staff to dig their test pits. 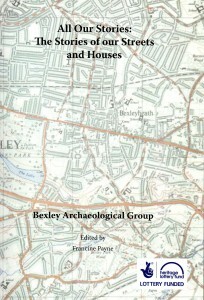 The book to mark the end of the project is now available from Bexley Local Studies. Alternatively, please email the Secretary.